What Is A Private Ad Exchange? | AdsWiki - Ad Network Listing, Reviews, Payment Proof & Advertising News. Home Articles What Is A Private Ad Exchange? Ad exchanges have gained popularity in recent years, and are a technology-based answer for more efficient real-time bidding on inventory, rather than negotiating prices based on volume as is the case with traditional advertising networks. Ad exchanges allow publishers to have ad networks and direct advertisers compete directly for each impression. Casale Media have taken the idea of ad exchanges one step further by allowing larger web brands and properties to set up private ad exchanges. These private exchanges allow premium publishers that already have strong brands to sell their inventory with real-time bidding to ad networks, media planners, and ad agencies. 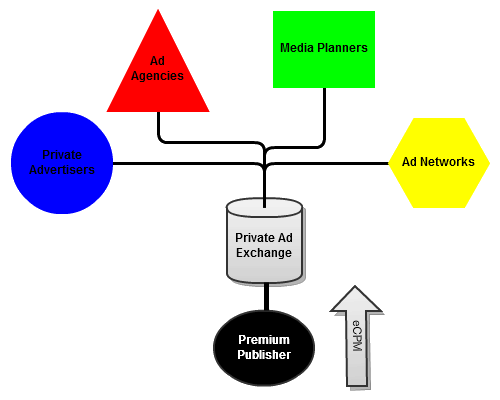 Whereas a public ad exchange does not differentiate between impressions from a certain location for each site included in the market, a private ad exchange allows premium publishers to sell their premium inventory at the premium it deserves. The inventory that is unsold in such a private exchange could then be filtered down into the public exchange to be sold at prices determined by the market. Several premium publishers have already moved to a private ad exchange solution for selling their digital ad inventory such as Technorati, CBS, IDG TechNetwork and NBCUniversal. The backbone of each of these exchanges is the unique data that these premium publishers have on their users and are willing to sell to advertisers to push up premiums – data which smaller publishers simply cannot provide. This extra data, as well as the security of a brand name digital publication for the advertisements – publishers can push up prices, something which is needed for television and newspaper corporations need if they are to move their entire businesses online and embrace the future.